Welcome to the first blog income report for Smart Money, Simple Life. I’ve debated whether or not to publish a report since I began seeing some revenue a couple of months ago. It was a real quandary for me, mostly because it felt like over-sharing. 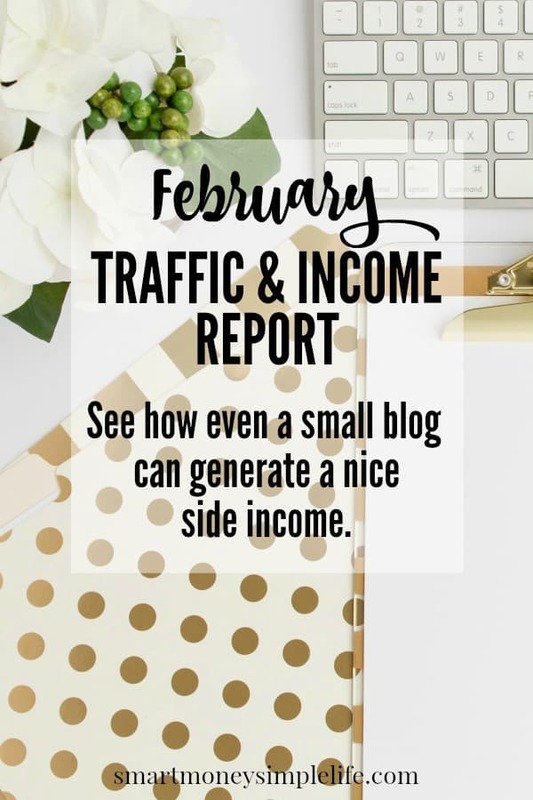 It was only when I thought about how inspiring it was for me to read the income reports of other bloggers; large and small, that I realised the income report from my own little blog might help inspire others, too. I hope my income report can provide some inspiration for those of you who aspire to create an additional income stream either via a blog you write now, or one you plan to publish in the future. So, here it is, my inaugural blog income report. Traffic to the blog was down a bit from the extraordinary heights of January (113,000+ page views). This might have been a reflection of changes to Pinterest or it might not. Smart Money, Simple Life receives a lot of traffic via Pinterest so this little hiccup reinforced my intention to broaden my traffic base. It’s your classic case of not having all your eggs in one basket. Interestingly, despite the dip in traffic, revenue, specifically Google Adsense revenue was up. My Google Adsense payment for January was $520. This is shows it’s not always all about traffic volume. In February, I also became an affiliate for Bluehost. Bluehost hosts my own blog and I’ve always been very happy with their service, so I’m happy to recommend their services to my readers. You can find out more here. The BookDepository is my absolute favourite place to buy books. It has great prices plus free shipping to just about anywhere in the world. I’ve been a dedicated fan for at least eight years and have made many (probably TOO many) purchases through them. Their service is always five star. Unlike a lot of other blog income reports, I wont be including any freelance income. For me, my freelance income is a part of my job rather than revenue from my blog. And, of course, this is a blog income report not an overall monthly earnings report. This will be converted to AU$ when it’s paid out. The BookDepository affiliate payments are made once you reach a minimum of £25. My total accrued so far is £16.46. As always, my plan is to grow. Grow my knowledge as well as grow this blog and my business in general. When you see the revenue begin to trickle in, your understanding of how things work in the online world becomes visceral; you feel it in your gut. You know that you can make it work, too. Just like all those other bloggers out there who share their (sometimes five figure) monthly blog income reports. Sure, five figures might be a totally out there figure right now. But in the future? Who knows? Maybe the sky is the limit! If you’ve ever considered starting a blog either as a business or just a hobby… Do it. Don’t delay. Jump right in. When I started this blog, I knew I loved to write. I was also fairly confident I had information and experience to share that could help others. And, I knew, beyond a doubt, I wanted a way to make a living that I could control. Blogging seemed like the perfect solution. It still does. If you feel the same way I do, you’ve got very little to lose from starting your own blog and an awful lot to gain. If you have any questions you’d like to ask me, leave them in the comments. I will do my best to answer them all. A great read Diane. Thanks for sharing. I’ve just posted my February income report too. I’m a way behind you. How long have you been blogging for? Thanks Lloyd! Off to check it out now. February was my 13th month blogging. It’s been one heck of a steep learning curve! Congrats, Diane! It’s great to see your success and it is really inspiring me to work harder at turning my hobby into a side gig! Congratulations, Diane! So inspiring! When I started my blog, I thought about monetising as I go on. I even bought Ruth’s book! But I realised it takes so much work and requires dedication which I can’t provide because I have a full-time job and study on the side. I can’t even stick to publishing one post a week. Ehe. Again, great job! I’ll be looking forward to your future blog income reports! Great! Diane! So motivating! When I began my online journal, I considered monetising as I go on. I even purchased book! Be that as it may, I understood it takes so much work and requires commitment which I can’t give since I have a full-time employment and study as an afterthought. I can’t stick to distributed one post a week. Thanks Floyd! It definitely requires commitment to take things to the next level. So far, so good! Well done, Diane! You’ve built a thriving business and your change of mindset to CEO will take you to another level. Keep up the great work! Thank you Pamela! There’s still a long way to go but I’m really happy with the progress so far.